Best conserve your oxygen, because here we’re revealing some under-the-radar thrillers that will leave you breathless. These three movies play within the boundaries of the genre, but each distinctively cuts out its own little corner to give viewers a unique and rousing experience. When global warming reaches critical mass, climate engineers try to counteract the deadly results, but the effects backfire and send the planet into an ice age that kills most of its inhabitants. The few remaining survivors take refuge on the Snowpiercer, a titanic train powered by a perpetual motion engine. Forced into submission by the commanders of the train, the famished residents residing in the tail carts continue to suffer in their putrid living conditions nearly eighteen years later. When cryptic messages incite the enslaved survivors to revolt, Curtis (Chris Evans) and a band of rebels hatch a plan to overthrow the class system by taking control of the train. Only horror awaits them though as the ragtag team battles their way through the many different compartments on their way to the engine room. The idea is seemingly high-concept, but as this story progresses, the complexity of this dystopian world reveals a far more extraordinary plot. 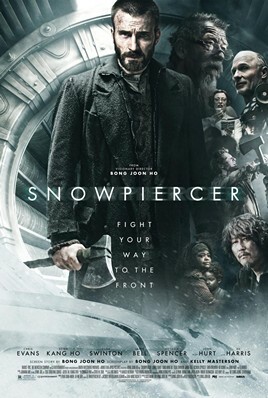 Directed and co-written by Korean filmmaker Bong Joon-ho, this poignant science fiction thriller masquerades as a high-octane action movie, but the originality and execution of the story make Snowpiercer one of the best films in recent memory. The brutal fight sequences have a rather glossy comic-book ambiance, but the applied grit and realism reinforce the severity of each blow. Symbolism and allegory play a prominent role as well, further adding to the film’s brilliance from a genre otherwise plagued in clichés. With an unpredictable story, stunning visuals, an eclectic cast, and relentless gumption, Snowpiercer can easily be deemed as the most exceptional and vastly overlooked film of the 21st century. Perfect for fans of: 2006’s The Host (also directed by Bong Joon-ho) and Danny Boyle’s Sunshine. On her 18th birthday, India Stoker (Mia Wasikowska) receives the tragic news that her father (Dermot Mulroney) has been killed in a car accident. 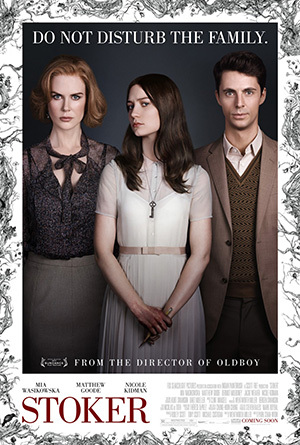 Left only with her bitter and distant mother Evelyn (Nicole Kidman), her world takes an unexpected turn when her charmingly enigmatic uncle Charlie (Matthew Goode) arrives to lend his support to the family. Despite having never met him, as Charlie’s spent his whole life traveling the world, Evelyn takes an immediate liking to her dead husband’s brother, inviting him to live with her and her daughter. India, however, isn’t so easily swayed by the charismatic stranger and gives him the cold shoulder. Suspicions only grow after the family’s caretaker (Phyllis Somerville) goes missing after India witnesses the woman arguing with her uncle. Her mother becomes closer to Charlie, but India rejects his efforts to befriend her. She finally begins to unearth the troubling secrets behind her uncle’s ulterior motives, and in a strange turn of events, the girl unexpectedly becomes infatuated with the man. There’s a reason why Ben Affleck, Matt Damon, Peter Berg and Sylvester Stallone redefined their careers writing screenplays. If the talent is truly there, something very beautiful happens when an actor sits behind a typewriter. Some do this from a place of frustration because they wish to showcase their talents by creating a character they themselves will portray, but others do it simply out of the love of storytelling. Stoker is definitely the byproduct of the latter, as actor Wentworth Miller (Prison Break) wrote this hauntingly off-kilter screenplay under the penname Ted Foulke to allow his writing to speak for itself. And what beautifully twisted things it has to say. Miller’s acting credentials definitely helped shape this script, as he masterfully substitutes clunky exposition for subtle actions to convey his characters’ back stories. As the old saying goes, “Showing is often more effective than telling.” This articulate touch is only further complimented by the lavish visuals of director Park Chan-wook. Stoker’s gothic elements tease with the boundaries of works like Rebecca, paying subtle homage to the likes of Hitchcock, and each actor radiates an unsettling sophistication. Matthew Goode, in particular, exhibits an old-school Gatsby-esque quality rarely put to film anymore, and that allure makes the sinister and aggressive aspects all the more disquieting. As Chan-wook’s English debut, he showcases his talents in glorious fashion by way of unbearable tension and stylish scenery. After cowardice inadvertently allows a United States Army Lieutenant to capture the enemy command at the height of the Mexican-American War, yellow-bellied John Boyd (Guy Pearce) receives a promotion to Captain but is relocated to the desolation of the Sierra Nevadas. He settles into his new position as second in command of a motley skeleton crew of eccentric soldiers, but the tedium of the remote outpost gets shaken to its core when a famished Scottish traveler (Robert Carlyle) wanders into the station nearly frozen to death. Relaying the grisly tale of horrors his wagon train faced after getting lost in the Rockies, the stranger convinces the lone crew to help him recover the remaining members of his party from a cannibalistic colonel plucking them off one by one. Blending Native American mythology with the terrors of the infamous Donner Party, director Antonia Bird and screenwriter Ted Griffin deliver one of the most unique, eloquently layered films to emerge from the genre. This delightfully wicked 19th century tale is anything but categorical and has thus gained a cult following. 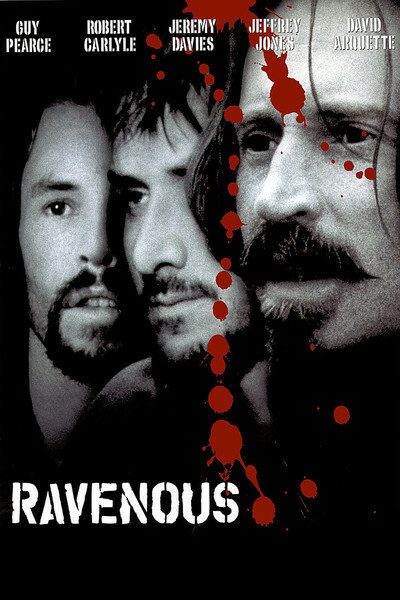 Ravenous continuously shifts genres by initially playing as a western before descending into horror, dark comedy, and suspense, before eventually coming a chamber piece, all the while remaining true to its ultimate message concerning Manifest Destiny. Though the story is compelling on its own, the mastery of Ravenous cannot be achieved without its stellar, colorful cast of character actors. Honestly, there isn’t another film quite like it to compare, but if you enjoyed Cabin Fever and 2010’s The Burrowers, chances are you’ll happily devour Ravenous. "Snowpiercer poster" by Source. Licensed under Fair use via Wikipedia. "Stoker teaser poster" by Source (WP:NFCC#4). Licensed under Fair use via Wikipedia. "Ravenous ver1" by Source. Licensed under Fair use via Wikipedia.